The church, as we see it today, is believed to have been built in 1719; it was enlarged roughly 100 years later, in 1823, when a gallery was added to provide seating for slaves. But the church’s history begins even earlier. Organized about 1710, it became a member of the first Charles Towne Presbytery, which was established by the Rev. Archibald Stobo in 1722. According to records, the Rev. Mr. Turnbull served as pastor from 1728 to 1737. In 1793, a church was built on nearby Wadmalaw Island to unite the people of both islands; in 1909, the churches separated into two distinct units. 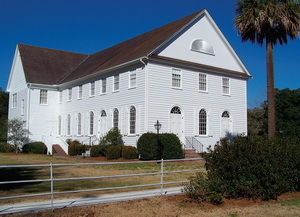 By 1925, the church on Bohicket Road was once again known as Johns Island Presbyterian. In its nearly three centuries of history, Johns Island Presbyterian Church has seen the Revolutionary War, watched as the Civil War pitted brother against brother and survived the Great Earthquake of 1886. And through the decades, the church has seen the island transform from deeply forested countryside to a place that is on the verge of becoming citified. As development carries the island into the 21st century, the church stands secure, knowing the congregation is dedicated to its preservation. Believed to be older than any other sanctuary in the major cities of Colonial America–including Charleston, Williamsburg, New York, Philadelphia and Boston–it is listed not only on the National Register of Historic Places but is also an American Presbyterian and Reformed Historical Site. Though it boasts a long and colorful history, Johns Island Presbyterian Church continues to look to the future and keep its promise to serve as a haven for all who enter for many years to come.